Easter Egg Hunt, but they’re just too good (wrong?) not to share. is going to be insane. Get yer bonnet and yer basket and come! 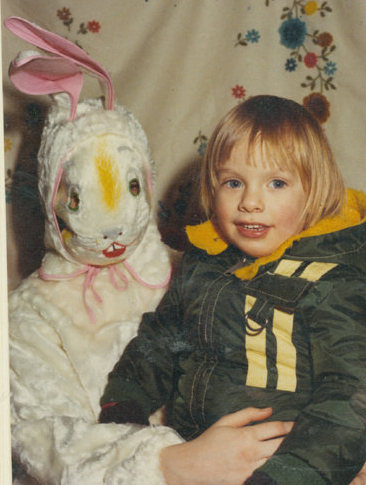 Who knew the Easter Bunny could be so damn creepy? The pink one with the cut out eyes and mouth scares me the most…eeek! But, I don’t see what’s wrong with the gray one at all, seriously, he’s beautiful. 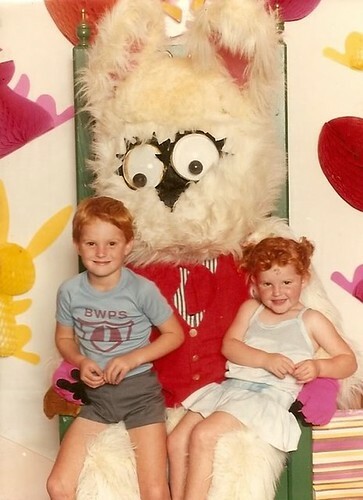 Sad to be missing bunny day with you two…I’m crying pearls..boo. 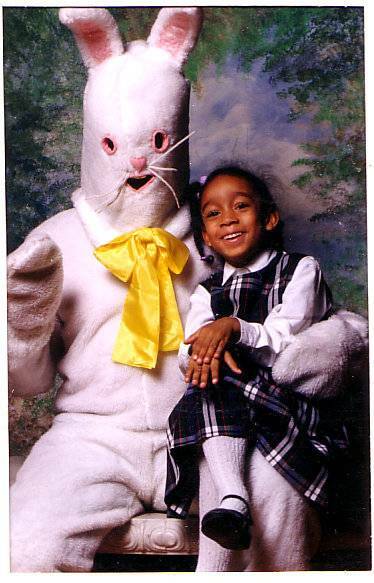 I have a few very special and *very* creepy bunny photos I will scan in and send to you. I think they may rival these…. Jeepers! This actually dredges up a quite a memory for me…! 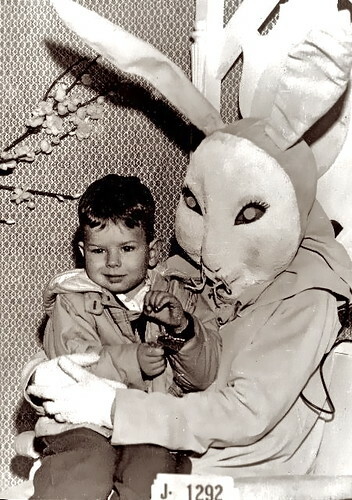 The night before Easter Sunday when I was around 4-5 years old is still one of the most terrifying nights that I can remember in my life. 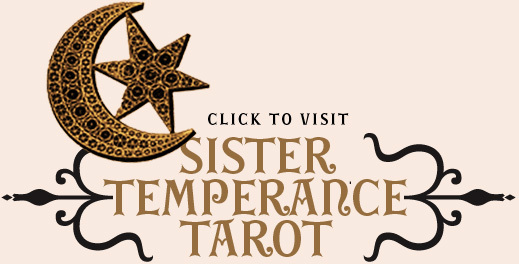 I recall being tucked into bed that evening and contentedly pulling the covers up around me, thinking on all the sweet candies, colourful hidden eggs, and holiday fun in store for my sisters and I the next day. 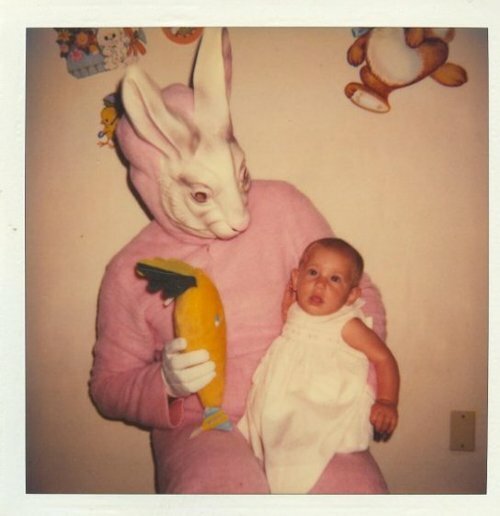 At that point turned my face toward the window and received a horrifying shock… peeking in at me from outside the glass pane was a appallingly grim mockery of the Easter Bunny! 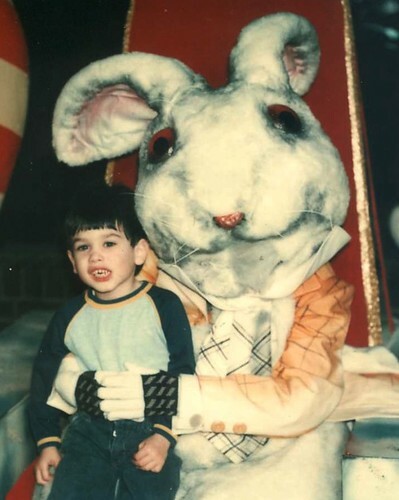 It was adult man-sized and had grotesquely angled flopping ears, black and broken whiskers and repulsively bulgy eyes. What was even more distressing was the fact that my bedroom was located on the second floor! Aieee! I will never forget that night. 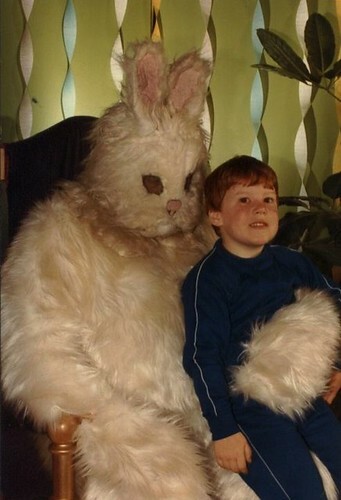 Um, if you promise me that there will be a sketchy bunny at your eggstravaganza tomorrow, I will be there with scaredy child ready for the photo makings. Yes. 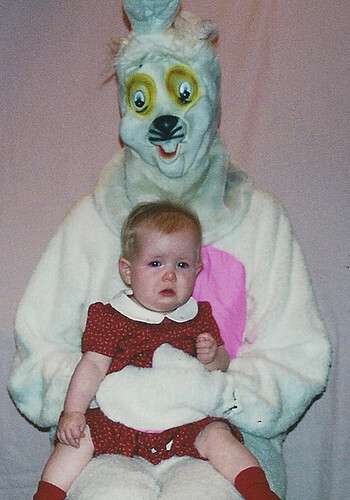 I willingly submit my baby for this hilarious torture. Oh, hi. What the hell am I doing up so late??? I don’t know that we’re going to make it, but we’ll totally try. I love you!!! thats so interesting. 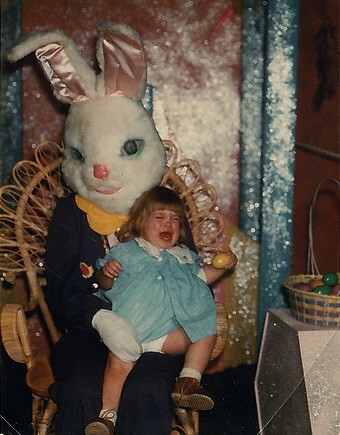 I was terrified of the easter bunny when i was 4 but not just because of the nasty tasting heavily dyed bluepeeps he would leave. one easter morning my sister found a plastic easter egg with a huge claw puncture in it!